Alvin, played by LJ Moses, performs "We Can't Stop," during the musical East of the River at the Anacostia Arts Center Friday night. 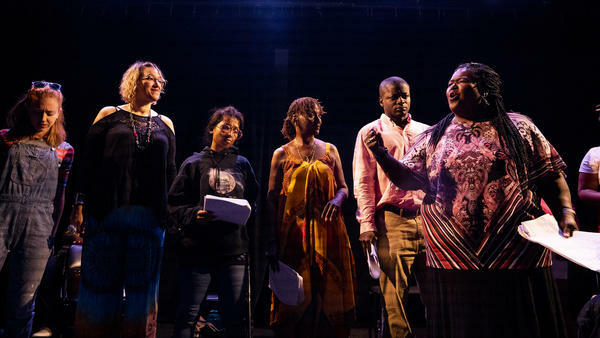 The cast of East of the River performs at the Anacostia Arts Center Friday night. Star Johnson, resident of D.C., is the writer and lead voice of the musical East of the River. Nothing says "gentrification" quite like the opening of a Whole Foods. That's the message, at least, of a new musical about the idea that a location of the largely organic, high-priced grocery chain could one day open in Washington, D.C.'s Anacostia neighborhood. Anacostia lies east of the Anacostia River in Southeast D.C., in a part of the city that's historically been more impoverished and more heavily African-American than other areas. Gentrification — or, as advocates would say, "revitalization" — has brought changes throughout D.C. over the past 15 years or so. Areas once blighted now feature shops with gourmet coffee and independent bicycle stores. Access to fresh and healthy food can increase for residents living in "food deserts," where it could previously have been hard to come by. New spaces for artists can open — like the Anacostia Arts Center, which opened in 2013, and where the musical East of the River held its first and so far only publicly announced performance in a workshop performance Friday. Star Johnson, the play's creator, wanted to show multiple sides to the debate about gentrification. "You don't have some of these tropes that you've seen before," Johnson says. "You know, the mean white guy saying, 'Get out of this neighborhood! This is my neighborhood now!' And you don't have all the black people saying, 'Don't take our neighborhood away from us!' It's varied reactions." Opponents note that gentrification can raise rents and the cost of living, and longtime residents — and artists — can be forced out in search of more affordable areas. Massive condominiums that all look the same start to crop up. White people start showing up in black neighborhoods. What the Washington City Paper once called the "most belabored story in the District" now has roots in Anacostia. "Something that I noticed while walking down Potomac Avenue [in Southeast] was a white woman with a stroller," says Johnson, who grew up in the D.C. area. "And I was thinking, what? Where am I? Something's changed, something has fundamentally changed," she says. Johnson interviewed residents around Anacostia about their neighborhood for the musical she wrote and directed. In East of the River, LJ Moses plays a young city planner who's come home with an urban planning degree and plans to "improve" Anacostia. In one scene he gets into a debate with a neighborhood friend, played by Alesia Ashley. "I'm proud of this place, to be a product of this place. I'm sorry, I'm not going to apologize for that," she tells him. "You don't see the crime and neglect in this neighborhood?" he responds. "Something has to give." "I see it, but I don't see how this project is going to fix anything," she says. "The people in this neighborhood aren't going to benefit because we won't be here in five years." "I think musical theater is the quickest, most effective way to get to the heart of a story," Johnson says. "Manchego cheese, fresh nuts and hand-carved meats, farm-raised eggs and bags of gluten-free everything. Sippin' tea with the Queen of England, I'm-a get fat from eatin' even if my little wallet takes a beatin'. Picture me standing standing round this posh olive bar. You wanna know 'bout delicacies? Come sit with me, I'm bourgeoisie." To be clear, there are no reported plans for a Whole Foods in Anacostia. "I always say, 'Gentrification is not good or bad, it's good and bad. And I don't know that it always answers the question that needs to be asked," Johnson says. She says the question is, "How do you retain the soul of these communities that have been here forever while making it a safer and happier place for the people to live?" A musical open for one night only in Washington, D.C., that asks, what threatens a great inner city American neighborhood - crime and poverty or organic produce and free-range poultry? UNIDENTIFIED ACTOR #1: (As character) And in four months, assuming everything goes as planned, we break ground right here on Good Hope and 17th for the very first phase of the project - a brand-new Whole Foods. SIMON: We went to one of the last rehearsals of "East Of The River" under the bright lights of a basement room in the Anacostia Public Library in Washington, D.C. Anacostia is one of D.C.'s poorest neighborhoods. As the song says, east of the river and east of the end of the Earth. UNIDENTIFIED ACTORS #1: (As characters) East of the river and east of the town, east of the end of the Earth, Anacostia. SIMON: As D.C. becomes wealthier and whiter, housing prices in Anacostia are starting to rise. Developers eye this neighborhood just across the water from the heart of the Capitol. STAR JOHNSON: Something that I noticed while walking down Potomac Avenue was a white woman with a stroller. SIMON: Star Johnson is the show's creator. She grew up in the area. JOHNSON: And I was thinking, what - where am I? Something's changed. Something has fundamentally changed. SIMON: But what do you call that change? JOHNSON: It depends on who you ask. Some people will say gentrified. Some people will say it's areas in transition or that have been transitioned. Some people will say areas where the complete soul has been sucked out of it. It just depends on who you ask. SIMON: And Star Johnson asked many residents of Anacostia how they feel about the change they can see beginning to come into their old neighborhood. JOHNSON: You don't have some of these tropes that you've seen before - you know, the mean white guy saying, get out of this neighborhood; this is my neighborhood now. And you don't have all the black people saying, don't take our neighborhood away from us. It's varied reactions. SIMON: It's a musical, too. JOHNSON: It's a musical. A playwright would probably disagree with me, but I think musical theater is the quickest, most effective way to get to the heart of a story. SIMON: To move people. To reach into them. JOHNSON: Yeah. In musical theater, when the dialogue reaches to a certain point, the emotion is just so strong that people sing. 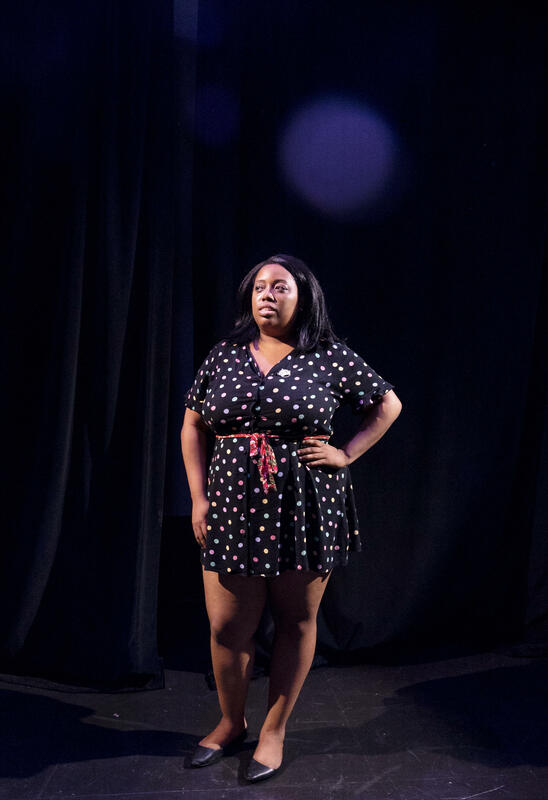 SIMON: Here's Brittney Sankofa playing Nikki, an Anacostia native. She sees hope in the possible arrival of all that organic goodness. BRITTNEY SANKOFA: (As Nikki, rapping) Manchego cheese, fresh nuts and hand-carved meats, farm-raised eggs and bags of gluten-free everything. Sipping tea with the Queen of England, I'm-a get fat from eating even if my little wallet takes a beating. Picture me standing round this posh olive bar. You want to know about delicacies? Come sit with me. I'm bourgeoisie. While y'all spending y'all last dollar on the same old din, I'm Jacques Pepin. I'm trying to be like those white folks. SIMON: There is not currently a Whole Foods in Anacostia or reported plans for one. But it lurks over the horizon in the plot of "East Of The River," captured in this song called "Manchego Cheese." 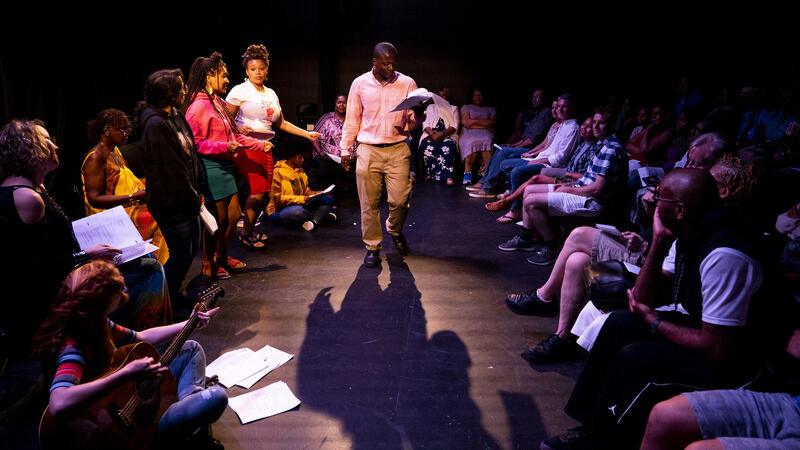 SIMON: The show features a pretty fair debate between a young city planner played by LJ Moses, who's come back home with an urban planning degree and plans to improve Anacostia, and a neighborhood friend played by Alesia Ashley. ALESIA ASHLEY: (As character) I'm proud of this place, to be a product of this place. I'm sorry. I'm not going to apologize for that. L. J. MOSES: (As character) You don't see the crime and neglect in this neighborhood? Something has to give. ASHLEY: (As character) I see it, but I don't see how this project is going to fix anything. The people in this neighborhood aren't going to benefit 'cause we won't be here in five years. UNIDENTIFIED ACTORS #2: (As characters, singing) Shine replaces grit. Style replaces spirit. Come on; hear it. There's somebody moving in. New residents take precedent. They're seizing all the benefits. At what expense? At what expense? At what expense? SIMON: But Star Johnson doesn't see the show she's put together about the costs of going from urban blight to artisanal lattes as a black-and-white story of villains and victims. JOHNSON: I always say gentrification is not good or bad. It's good and bad. And I don't know that it always answers the question that needs to be asked. I think it answers a question but not necessarily the one that needs to be asked. SIMON: Well, tell me that one. JOHNSON: How do you retain the soul of these communities that have been here forever while making it a safer and happier place for the people to live? How do you do that? UNIDENTIFIED ACTOR #2: (As character, singing) Rivers form a barrier. No one's going to bury us. SIMON: "East Of The River" opened last night for its first and so far only scheduled performance. The show ends with a rousing vow that makes you think the story it tells and the people who sing it will be back. UNIDENTIFIED ACTOR #2: (As character, singing) No one's going to bury us. UNIDENTIFIED ACTORS #3: (As characters, singing) No one's going to bury us. UNIDENTIFIED ACTORS #2: (As character, singing) No one's going to bury us. UNIDENTIFIED ACTORS #3: (As characters, singing) No one's going to bury us. Transcript provided by NPR, Copyright NPR.